The Prosthesis is suspended and controlled by a northwestern ring harness. 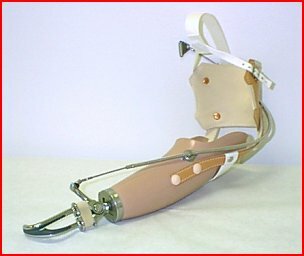 The prosthesis shown above,was fabricated with flexible hinges and a leather triceps pad. Optional single pivot or polycentric steel hinges and a plastic triceps pad are available for short below elbow limbs. The terminal device is controlled by a posterior cable attached to the chest harness. Opening terminal the device is achieved by shoulder excursion or reaching forward with prosthesis. Terminal device may be replaced with voluntary opening hand and cosmetic glove. 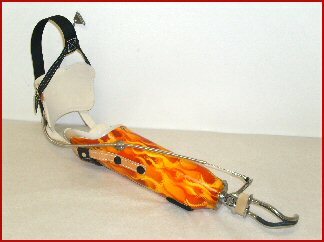 For more options and in depth instructions on this prosthesis contact the Rehab Indy Staff. Wild below elbow conventional prosthesis.